Take loads of fresh vegetables, small portions of lean meats, a healthy handful of quinoa and other whole grains, add a sprinkling of cumin and paprika, mix with world flavors, and the result is the essence of Leah Koenig’s new cookbook, “The Hadassah Everyday Cookbook: Daily Meals for the Contemporary Jewish Kitchen” (Universe, $34.95). 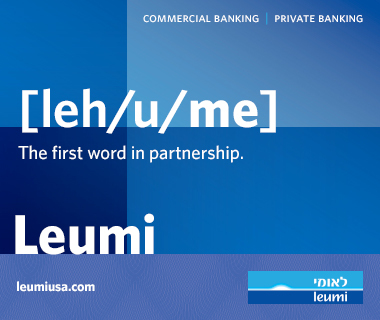 “It’s about trying to meld together traditional Jewish tastes with contemporary global palette that we all eat today,” Leah said. Originally from Oak Park, she has lived in New York City for almost seven years. She writes about food for The Forward and other publications, and also used to edit the award-winning blog “The Jew & The Carrot” for Hazon, the Jewish environmental organization. Leah embraced the search for great everyday recipes by culling from her own extensive collection and asking family and friends to contribute. The pepper steak recipe on page 152 is her mother’s as is the “Moistest Chocolate Cake,” which was a staple of birthday parties throughout her childhood. 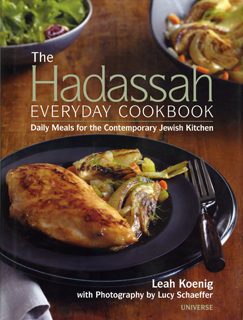 The cookbook is a departure from the Hadassah mold of a collection of members’ recipes. Moreover, traditional fare like chicken cutlets and borscht sits alongside more exotic ingredients like Indonesian tempe, tofu and za’atar. Divided into eight sections—Breakfasts and Breads; Salads and Spreads; Sandwiches and Pizzas; Soups and Stews; Sides; Mains; Sweets; and Anytime Snacks—the book is full of color photos and useful tips accompany each recipe. The back of the book features several pages of menu ideas, which combine the recipes into meals: a hearty fall dinner or a movie night or a lazy Sunday brunch. Although most recipes are meant to be prepared quickly by busy home chefs, she tried to avoid limiting herself to the Rachael Ray 30-minute-meal philosophy. With Pesach coming up, home cooks are likely to scramble to put elaborate fare on the Seder table. But the intermediate days of the holidays are where this book will come in most handy. With recipes like Shakshuka, Quinoa-Stuffed Squash with Pears and Cranberries, or Brown Sugar-Glazed Salmon, Leah offers plenty of dishes for kosher home-style meals during Hol Hamoed—after a few small-time substitutions to keep within the regimens of the holiday. Leah said compiling the book was akin to a rigorous cooking course; recipe testing played a key role. She shares some of the tricks of the trade in the book, which she hopes will be a point of reference for newer cooks who are less comfortable with the idea of improvisation.